Your contract is with Steve & Alison Morgan, trading as "The Agent's House Bed and Breakfast". Please read these terms carefully as you will be bound by them. A contract between us will come into force when you reserve a room and pay a deposit. Check in is between 16.00 and 18.00 hours. On the day of departure, we ask guests to check out by 10.30 hours (11.00 on Sundays/public holidays). We do please ask guests to respect these timings, as this is a small establishment and the proprietors are not able to offer a 24/7 service. Although we cannot generally make rooms available before 16.00 hours, we may be able to accommodate an earlier bag drop-off if you telephone in advance. Similarly, if you are likely to arrive after 18.00 hours, we would appreciate it if you could let us know as we occasionally have evening commitments. Late check-out (13.00 hours) may be possible for a small cover charge. Please enquire for details. Rooms are reserved by payment of a deposit or pre-authorisation of a debit or credit card, dependent on the terms of the chosen booking agency. For on-line bookings, this is payable/required at the point of booking; deposit amounts will vary depending on the agency through which you booked. For direct bookings, a deposit equivalent to one night's stay, per room, is requested. The balance is due on departure or in accordance with our cancellation policy (see below). Confirmation of your booking will be sent automatically by email when you book on-line. If you book by telephone, confirmation will be provided either by email or post on provision of appropriate contact details. Our rooms are furnished for double, adult occupancy although it may be possible to add a single, guest bed. If the additional bed is to permit two people sharing the room to sleep separately, a £25.00 laundry charge is applied per stay. Please email or telephone prior to booking on-line, as we will need to check the single bed is available. To accommodate babies/toddlers, a travel cot and/or high chair can be provided free of charge, subject to availability. Please check with us by email or telephone if you need these items, prior to confirming your booking. Additional guests: it may be possible to provide a single, guest bed to accommodate a third person. A supplementary charge of £25.00 per night will apply in this case. Again, please call or email to discuss your requirements and ensure availability. Pets: guests may be permitted to bring well behaved, house-trained dogs, cats or other small animals, on request. A cover charge of £10.00 per stay will apply. NB: please contact us to discuss further before making an on-line booking if you wish to bring a pet. Room rates shown on our website are per room, per night; supplementary charges may be applied, as indicated above. Prices include ingredients for preparation of breakfast on a self-catering basis. Guests are kindly advised to make us aware of their breakfast choices by returning the Breakfast Options form that will be sent prior to your arrival. This helps enable us to source fresh ingredients from local suppliers, wherever possible. A range of cook and non-cook options is available, but if you particularly want something that is not advertised, please ask and we will do our best to accommodate your tastes. Depending on the request, a small additional charge may be applied, although this is not typically the case. Please contact us as soon as possible after booking if you have any special dietary needs. We will be happy to discuss your requirements. If you book on-line using a link from the web site of one of our distributors, you will be bound by the cancellation terms of that agent, which will be displayed to you at the point of booking. Please note that when booking through certain accommodation providers, it may not be possible for us to cancel or change your booking directly. To avoid unwanted cancellation penalty charges, you are advised to read the applicable terms and conditions carefully. For direct bookings, cancellation must be made more than 48 hours prior to the planned start date for the deposit to be refunded. A £5.00 administrative fee may be applied to all such cancellations. If cancellation occurs less than 48 hours before the planned arrival date, no refund will be made and the full amount is payable. For 'no shows', no refunds will be made. We strongly recommend you purchase personal travel insurance, in case of unforeseen circumstances. We are required to maintain a register of our guests. Residents of the UK and other European Union countries shall provide full names and addresses. All other guests must provide a valid passport on check-in, together with details of their next destination. By providing us with this information, you are deemed to agree we may retain it for a period of 12 months. We will not share this information with any third parties. Off-road parking is available for Josie's Annexe in a private driveway; parking for the Agent's Office is in the road outside the property. The Agent's House is situated in a generally quiet residential road and we therefore request guests to be considerate of our neighbours at all times. Cars and their contents are parked entirely at the car owner's risk. Please note we are non-smoking in both the house and garden areas. Both rooms are located on the ground floor through their own front doors. 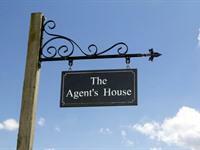 There is a pathway approach from the road and two steps into the Agent's Office room. Access to Josie's Annexe is from a driveway up one small and two larger steps, then a short walk across a shingled courtyard. The front door is accessed via a further two steps. Once inside, both rooms are on a single level with hard flooring. It may be possible to provide a ramp to assist with access to the Agent's Office - please ask - and a shower chair is offered for either room, subject to availability. For further details, please refer to our Access page. The Agent's House Bed and Breakfast reserves the right, at its discretion, to terminate without notice an individual's stay in any of its rooms where deemed necessary.